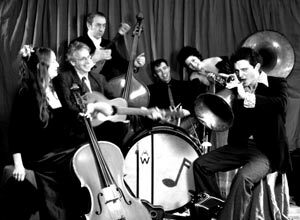 Michael Roderick founded Mood Area 52 in 1998 as a Piazzola inspired neo-tango ensemble. Since then the group has incorporated Golden Age Tango material, lounge, electronica, Eastern European influences, polyglot vocal material, Brechtian cabaret tunes, chanson, and original compositions about love, loss, genetic mutations, daring women in petticoats, and the ill-hatched crimes of ambitious charlatans. The Band performs acoustically as a duo with Michael Roderick and cellist Amy Danziger, and expands into a quintet, combining the talents of accordionist and vocalist Michael Roderick, cellist Amy Danziger, guitarist Billy Barnett, bassists Dorian Crow and Jeremiah Harris, and drummer James West. Mood Area 52 also features various Oregon musicians including Erin Williams on saw, Dustin Lanker, Mckenzie Stubbert, Dan Schmidt, Sylvain Duplant, Dylan DeRobertis, Anthony Dyer, Derek Trost, Kee Zublin Adam Wendt, David Roderick, Cosmos Corbin, Marietta Bonaventure, Kelly Leguizamon, and Richard Johnson, adding horns, strings, drums, and additional vocals. Mood Area 52 has performed with The Squirrel Nut Zippers, Naim Amor, Chuck Palhnuik, The Damo Suzuki Network, Rasputina, The Tin Hat Trio, Slowpoke, Amy Denio, Devotchka, David Lindley, Marianne Dissard, The Vagabond Opera, Jason Webley, Mark Growden, Kim Boekbinder and The Vermillion Lies, and many other polite and brilliant musicians. They perform in venues ranging from clubs to festival stages to alzheimers wards, accompanying burlesque troops and providing original soundtracks to golden age films. Mood Area 52 has written and performed original soundtracks to F.W. Murnau's "Nosferatu", Marks' distopian sci-fi classic "La Jette", Sunset Boulevard, Buster Keaton's films, the short films of Geoges Mellies, numerous independent films, and select advertisements and television programs.